This article is an adaptation of a workshop Dr. Spett gave at a conference of the New Jersey Psychological Association. Schemas are self-perpetuating systems of interacting cognitions, emotions, and behaviors toward the self and the world. To be more exact, schemas are propensities to think, feel, and behave in certain ways. For example, patients with low self-esteem schemas tend to believe that they have failed when they have not, tend to feel inadequate or guilty when they are not, and they have urges behave ineffectively when they possess the skills to behave effectively. Also, low self-esteem patients often believe that others disapprove of them when others do not. There is a tendency toward consistency among all the components of a schema. So if low self-esteem patients initially believe that they have behaved effectively, as time passes, their low self-esteem schemas would convert that belief into a belief that their behavior was ineffective or even humiliating. Schemas are situation specific, so patients may have a self-confidence schema in some situations, perhaps in their work, and an inadequacy schema in other situations, such as personal relationships. When a schema is not being experienced it is dormant, but it still exists and will be activated under stress or if certain events trigger it. 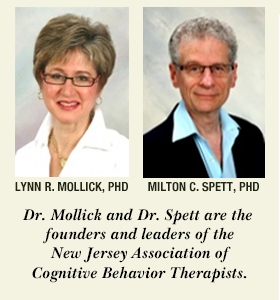 Our goal as therapists is not just to help patients think, feel, and behave functionally. Our goal is to weaken or eliminate patients' dysfunctional schemas, so that without our guidance and regardless of the situation or the stressor, our patients will think, feel, and behave functionally. Patients often report that they had a good week because they were successful, or they handled situations effectively, or they received positive feedback and they felt good about themselves. But I do not consider this a good week. A good week is when patients make mistakes, fail, or are criticized, but still feel good about themselves. A good week is when situations occurred that previously evoked patients' dysfunctional schemas, but no longer do so because those schemas have been weakened or eliminated. 1. Spontaneous schema change sometimes occurs when patients experience and clearly understand their dysfunctional emotions in the context of a supportive therapeutic relationship, or when thinking, writing, or talking about situations that evoke their dysfunctional schemas. 2. Gentle questioning can sometimes nudge patients toward schema change. 3. Disputing our patients' dysfunctional cognitions and encouraging their functional cognitions and behavior while they are experiencing dysfunctional schemas are the most aggressive approach to schema change. Therapeutic techniques should be geared to the patient's ability to tolerate directive interventions. More gentle techniques work best with patients who are resistant or who tend to feel controlled. More directive techniques are more powerful for patients who can tolerate these techniques. Schema change requires repetition. Patients slightly weaken their dysfunctional schemas each time they think and/or behave functionally while experiencing a dysfunctional schema. Patients may not notice much change each time they think and/or behave functionally while experiencing a dysfunctional schema, but if they do this repeatedly, they will eventually recognize that their dysfunctional schemas have weakened significantly. Eventually, thinking, feeling, and behaving functionally will become just as automatic as thinking, feeling, and behaving dysfunctionally used to be. Before a schema can be weakened, the patient must not only experience the emotion, but also have a clear understanding of the emotion and the associated cognitive components of the schema. Repeatedly discussing and exploring events that trigger the schema, and the associated cognitions, emotions, and behaviors can help patients to clarify and understand confused or jumbled emotional reactions. Expressing an emotion can help a patient to more fully experience that emotion, but it is experiencing and clearly understanding the emotion, not expressing the emotion, that enables therapeutic change. Thinking or writing about an upsetting experience can enable a patient to experience, clarify, and understand the emotion, and eventually change the cognition. Patients' natural impulse is to reduce the intensity of their negative emotions, often by keeping busy to distract themselves from their negative emotions. It is often pragmatic to temporarily suppress negative emotions in order to accomplish some necessary task. But if patients keep constantly busy and never or rarely experience their negative emotions, those patients' propensities to experience and be controlled by their dysfunctional schemas will never change. Patients' dysfunctional schemas will remain dormant, but they will remain, and patients will continue to experience dysfunctional cognitions, emotions, and behaviors when these schemas are triggered. Once an dysfunctional negative emotion is experienced, clarified, and understood, our job is to help patients identify and change the associated dysfunctional cognitions and behavioral propensities. Cognitive change is the driving force behind schema change. It is not possible to directly change dysfunctional emotions by an act of will, but cognitive change will eventually lead to emotional change and schema change. Behavioral change without cognitive change can temporarily alter patients' thoughts and feelings but will not weaken dysfunctional schemas. To effect schema change, behavioral change must lead to cognitive change. 1. Confront the situations that evoke their dysfunctional schemas, their anxiety symptoms and the situations that provoke these fears. 2. Work on changing their cognitions – usually their cognitions that their anxiety symptoms and the situations that provoke their anxiety symptoms are dangerous or intolerable. The most important cause of panic and phobias is the fear of panic and phobic symptoms. We encourage panic and phobic patients to expose themselves to situations that evoke their symptoms and to remain in those situations until their symptoms diminish significantly. We also advise patients to passively wait for the symptoms to diminish, doing nothing to avoid, escape, or diminish their symptoms. This intervention changes patients' cognitions that their symptoms are dangerous or intolerable. Exposure exercises cause panic and phobia patients to experience their dysfunctional emotion (anxiety) and change their dysfunctional cognitions about this emotion and the situations that provoke it. The first step in CBT for PTSD is also to expose patients, usually through imagination, to the traumatic situation which evokes their dysfunctional emotion. Another technique for experiencing the emotion is to revisit the scene of the original trauma. When treating PTSD there are two CBT approaches to changing the cognition. Edna Foa advocates waiting passively for spontaneous change in the patients' dysfunctional cognitions of danger, fear, or guilt. Patricia Resick suggests that in addition to exposure, therapists and patients actively dispute these dysfunctional cognitions. In CBT for OCD, an obsessive thought evokes the emotion – anxiety, and the key dysfunctional cognition is the patient's negative evaluation of the obsessive thought and the ensuing anxiety. By exposing patients to their obsessive thoughts and anxiety, patients gradually change their negative cognitions about these thoughts. Again, the key interventions are having patients experience their dysfunctional emotion (anxiety over a thought) and change their dysfunctional cognition (the obsession signifies some danger). One way to change patients' dysfunctional cognitions about their obsessive thoughts is to explain that most people who do not suffer from OCD have these very same thoughts, but they do not have dysfunctional cognitions about these thoughts. It is the catastrophic cognition about the thought that converts it into an obsession. We also ask OCD patients to refrain from performing their compulsions. These compulsions are assumed to serve the function of reducing the anxiety provoked by the obsessive thought. 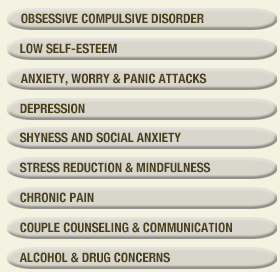 Compulsive behaviors are counterproductive because they impede experiencing the emotion – anxiety. In addition, any behavior that attempts to reduce anxiety strengthens the dysfunctional cognition that the thought and the anxiety are dangerous or intolerable. Any form of relaxation, meditation, or breathing exercise can be counterproductive by impeding experiencing the emotion of anxiety and by strengthening the dysfunctional cognition that the anxiety is dangerous or intolerable. In addition, relaxation techniques should not be used with panic, phobias, PTSD or OCD, because unless the anxiety is very weak, relaxation techniques don't work. Instead, we should encourage patients to fully experience their emotion — anxiety — and change their dysfunctional cognitions about that emotion and the situations that evoke it. Relaxation is sometimes helpful when treating generalized anxiety disorder. This is because learning to relax can change patients' dysfunctional cognitions that they have no control over their symptoms and their lives. There is no research on the question of whether treatment of depression is more effective when the patient is experiencing the depression. But research has found that when depressed patients are not experiencing their depression, that is, when their depressive schema is dormant, depressed patients' thoughts, feelings, and behaviors are indistinguishable from those of non-depressed individuals. So it seems reasonable to assume that when depressed patients are not experiencing depressed thoughts and feelings, those patients' depressive schemas are dormant and more difficult to access and weaken. The depressive schemas of patients who experience chronic depression are almost always active and susceptible to change through cognitive and behavioral interventions. But with patients who experience episodic depression, it is helpful to ask these patients to be aware of when they experience depressive emotions, and pay attention to their emotions and cognitions when they are depressed instead of keeping busy to distract themselves from their depression. This technique enables depressed patients to experience and clarify their depressive cognitions and emotions. When they experience rather than avoid their depressive cognitions and emotion, most patients report that the depressive episode passes more quickly. In addition, they become less afraid of their depressive symptoms and better able to clarify and change the dysfunctional cognitions that are part of their depressive schemas. The depressive schemas of severely depressed patients are probably too strong to be weakened by experiencing them or by challenging them. This is why behavioral activation has been found to be superior to cognitive interventions for severely depressed patients. I have treated several depressed patients whose progress was directly correlated with their ability to fully experience their depressive schemas, both in sessions and between sessions. Doris, a depressed patient I treated, made her greatest progress when she was finally able to remember and re-experience the intense emotion associated with certain childhood events. Doris called me one morning and asked if she could see me that day. I asked if she could wait for her regular appointment in two days. She said "no," so I saw her that day. In our session Doris talked about the depressive memories, emotions, and cognitions she was experiencing at that moment, emotions and cognitions she had suppressed for many years. At the end of the session she said the session had been very helpful, and she added that if she had waited until her regular session, she would have re-suppressed the memories, emotions and cognitions she had experienced and explored in the session. Medication can suppress psychological symptoms temporarily, but after a course of medication, patients are just as likely to experience their psychological problems as they were before taking the medication. The benefits of medication are temporary, but the benefits of psychotherapy endure, and sometimes increase, after treatment is terminated. So if our goal is to cure our patients rather than provide palliation, psychotropic medication should be evaluated in terms of whether it facilitates or impedes our attempts to help patients experience their emotions and change their dysfunctional cognitions. Medication can sometimes provide a quick improvement in symptoms, possibly preventing a serious, real-life loss, such as the loss of a job or the dissolution of a marriage. But medication can also cause a patient's dysfunctional schemas to become dormant and inaccessible to psychotherapy. Two follow-up studies of anxiety disorders, one led by David Barlow and one led by Michael Otto, have found that CBT alone is more effective than CBT plus medication. Avoiding negative emotions makes patients comfortable in the short run, but prevents them from overcoming their psychological problems in the long run. Experiencing negative emotions makes patients uncomfortable in the short run, but presents the opportunity for overcoming their psychological problems in the long run. Wilma was a depressed patient who entered psychotherapy while taking an antidepressant. We discussed certain events which had done serious damage to her self-esteem, and which evoked some dysfunctional emotions and cognitions. She was improved, but she still experienced some depression. Then she weaned herself off her medication. Now we explored these same experiences again and she reported substantially more depressed emotion. I made the same interventions I had made previously, and after a few months Wilma was completely over her depression. She called sixteen months after termination about another matter and reported that she continued to enjoy life with absolutely no periods of depression. Her medication had initially been suppressing her depressive emotions and her depressive schema, making them partially dormant and less accessible to therapeutic intervention. When Wilma fully experienced her emotions, she made the greatest therapeutic progress. Psychodynamic therapists emphasize the first core component of effective psychotherapy – helping patients to experience their dysfunctional emotions and activate their dysfunctional schemas. When psychodynamic therapists encourage their patients to explore early experiences, the therapists are not attempting to change those early experiences. Psychodynamic therapists are trying to change patients' current unconscious thoughts and feelings which may have been caused by those early experiences. But what are unconscious thoughts and feelings? What is a feeling that you don't feel and a thought you don't think? Unconscious thoughts and feelings are propensities to experience certain emotions and cognitions that are not currently being experienced. In other words, unconscious thoughts and feelings are dormant dysfunctional schemas. Dysfunctional schemas can be activated when patients explore early negative experiences. Dysfunctional schemas can also be activated when patients explore recent or current negative events. Unfortunately, psychodynamic therapy has no formal mechanism for changing dysfunctional cognitions, the second core component of effective therapy. Sometimes patients in psychodynamic therapy change their cognitions spontaneously once they clearly understand their dysfunctional cognitions and emotions in the context of an empathic therapeutic relationship. Sometimes psychodynamic patients change their dysfunctional cognitions in response to behavioral suggestions from their psychodynamic therapists. Many patients who were formally in psychodynamic treatment have told me that their psychodynamic therapists helped them understand themselves, and also gave them some good advice about handling current situations. Sometimes psychodynamic patients change their dysfunctional cognitions in response to gentle questioning from their therapist. I once gave a workshop with a psychodynamic therapist in which we each explained how we would treat specific cases. The essence of the differences between our approaches is that I would say to patients, "You should do X," while the dynamic therapist would say "I wonder why you don't do X?" This question clearly implies that the patient should change her thinking about doing X. I would argue that psychodynamic therapy often changes dysfunctional cognitions by gently, indirectly suggesting that patients change their dysfunctional cognitions and behavior. Cognitive-behavioral therapists have many effective techniques for changing dysfunctional cognitions and schemas. But, CBT therapists tend to overlook the importance of first helping patients to experience and clearly understand their negative emotions, the best way to activate patients' dysfunctional schemas and make them available for therapeutic change. 1. Confront the situation that evokes the emotional problem, either in vivo or by talking, thinking, or writing about it. 2. Experience the dysfunctional negative emotions. 3. Clarify and understand these emotions. 4. Do not act in accordance with these emotions. 5. Identify and change the associated dysfunctional cognitions. 6. Each time this process is repeated, the dysfunctional schema becomes a little weaker and functional schemas become a little stronger.